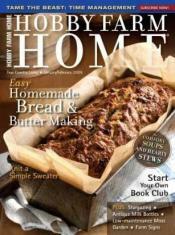 Today only, get Hobby Farm Home Magazine for only $7.99 per year – savings of 46% off the regular price. Just enter coupon code CHEAPSKATE at checkout when you order before 11:59 p.m. EST on Thursday, April 25, 2013. According to the description, Hobby Farm Home celebrates traditional farm life with modern flair. Articles include cooking with home-grown produce and farm-raised meat, the decor of the farmhouse, reviving farm traditions, the handmade creation of objects, and bringing the farm indoors. Looking for other magazines? Save 20% on your DiscountMags.com order when you use the code CHEAPSKATE at checkout.